Hero MotoSports Team Rally managed to maintain a decent position after Day 2 of the 2017 Dakar Rally. The second stage was much longer than the first one, with the competitive section measuring a 275km out of the total 803km. 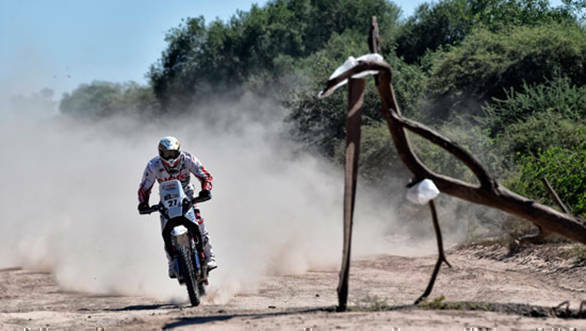 According to CS Santosh, "It was the first real stage of the Dakar and it was really fast." He also said that it was the "kind of stage where you could pay a big price for a small mistake and ruin your rally." With a lot of cautions on the stage, the route was made even trickier by the numerous unmarked water puddles that had formed due to the previous days' rain. This forced him hold back in the first half of stage, till he managed to find his pace and beat 10 riders. He completed the stage in 3hr7m41s, and is currently 37th in the overall Bike category. His team-mate, Joaquim Rodrigues, had a slightly tougher time getting through the stage after he slid and crashed his bike at one of the unmarked water puddles. His GPS, which got wet, malfunctioned after the incident and forced to him to rely the road book and reduce his pace to avoid crashing again. However, despite this, he managed to finish the stage in 2hr51m53s and dropped just six places to stand at 22nd ahead of Stage 3.